Donald Trump says "I'm ready, I'm absolutely ready" to face Megyn Kelly at Thursday's Republican debate. The two have not spoken since the day they clashed at a debate last August. Fox isn't calling it a rematch, but everyone else is. The face-off is expected to be one of the highest-rated GOP debates of the season thus far. In a pre-debate interview with Reuters, Kelly said, "Frankly, I have been ready for seven months to move beyond what happened after that August debate. I feel like it's getting boring. Trump has bigger things to worry about, and so do I." Kelly told Reuters that she hasn't come up with a comeback or a way to corral Trump in the event he insults her. "I have my questions," she said. "That's all I need." One of her co-moderators, Bret Baier, similarly told The Wrap that "we haven't gamed that out." "Megyn, as I've said many times, is a big girl and can handle herself. We'll be sitting next to her and would obviously step in if needed, but it's never needed," he said. What Baier wants, he said, is a headline the next morning that says "Fiery but substantive debate." The debate begins at 9 p.m. Eastern time on Fox News. Chris Wallace is the third moderator and Ted Cruz, Marco Rubio and John Kasich are the other debaters. Trump has been highly critical of Kelly ever since she challenged him at the August 6 debate about his treatment of women. She referenced the times he had called various women "fat pigs," "dogs," and "disgusting animals." Kelly and her allies say she was just doing her job as a journalist. But Trump said she was unfair to him and "behaved very badly" at the debate. The opening question was a level "10" on purpose. She told The New York Times: "One of the reasons the first debate was so dynamic was because we opened up with a 10 for each candidate." This time around, she said, "We probably want to ease into it a little more." In the wake of the August debate, Trump sought to turn his supporters against her, labeling her biased and conflicted. Some Trump fans called for a boycott of Kelly's 9 p.m. Fox News program, although her ratings never seemed to be hurt in a meaningful way. On several occasions Trump even retweeted supporters who called Kelly a "bimbo." The animosity from Trump contributed to an on-again, off-again feud between Trump and Fox News, conservatives' favorite cable news channel. While many other Fox News hosts have interviewed Trump in recent months, and some like Sean Hannity have openly cheered him on, Kelly has not interviewed him. Trump snubbed a "Voter's Forum" that Kelly's show held last month. So there hasn't been a "rematch" yet. It would have happened on January 28, when Kelly co-moderated Fox's second GOP debate, but Trump decided not to participate. In the days leading up to that forum, Trump tweeted, "Based on Megyn Kelly's conflict of interest and bias she should not be allowed to be a moderator." 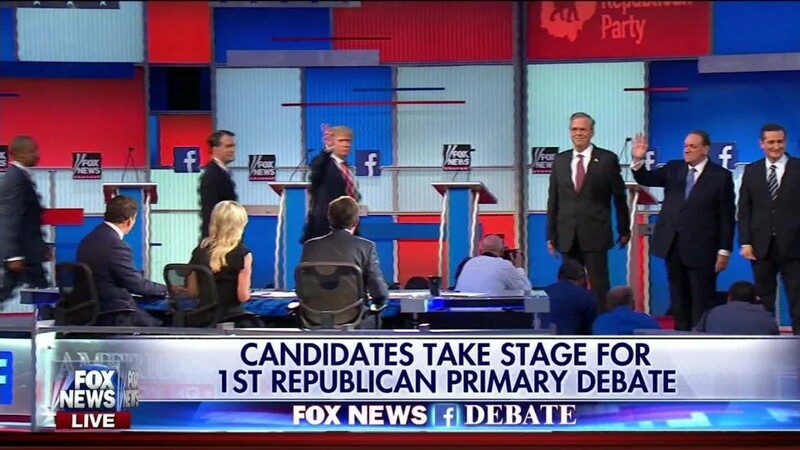 Eventually Fox fired back with a sarcastic statement, and Trump cited it as a reason to skip the debate. Things haven't been as tense this time around. Trump has refrained from any public threats to skip the debate. On Tuesday he said "I'm not gonna skip it. But I think these debates are ridiculous now. I mean, you get the same answer over and over again." And on Thursday morning he said on "Good Morning America" that "I'm ready." Kelly has indicated that she's ready, too. Speaking with the TV show "Extra" at Vanity Fair's Oscars after-party on Sunday night, she said, "I have my questions that I wanted to ask him at the last debate and I just moved them right over to this debate, so that's my plan. Those that were wanting to see what I would ask him in Iowa, tune in Thursday."